I’ve no idea how Klout works out it’s scores, but I’m guessing that there is an element of PageRank style algorithmic bootstrapping going on, in which a person’s Klout score is influenced by the Klout score of folk who interact with a person. One thing I’ve noticed about my Klout scrore is that it tends to be lower than most of the folk I have an OU/edtech style relationship with; and no, I don’t obsess about it… I just occasionally refer to it when Klout is in the news, as it was today with an announced tie up with Bing: Bing and Klout Partner to Strengthen Social Search and Online Influence. In this case, if my search results are going to be influenced by Bing, I want to understand what effect that might have on the search results I’m presented with, and how my content/contributions might be being weighted in other peoples’ search results. Sort of, but not quite, related: a few articles on sampling error and sample bias – Is Your Survey Data Lying to You? and The Most Dangerous Porfession: A Note on Nonsampling Error. Tony – interesting post as always. 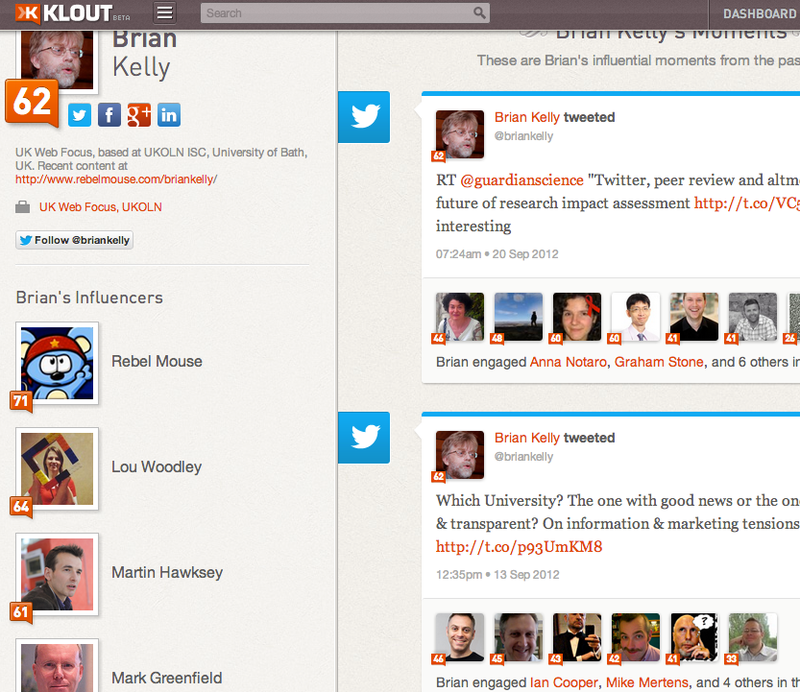 I’ve been kind of ignoring Klout too. Although I use twitter and google plus, and do a bit of blogging, I have so far completely avoided facebook – don’t even have an account. I wonder if it is possible to have a high Klout score whilst completely ignoring a large piece of the networking universe – meaning does being very active in a particular area (say twitter, blogging) completely compensate for non participation (I assume that facebook doesn’t figure very highly in your daily community interactions) in others. 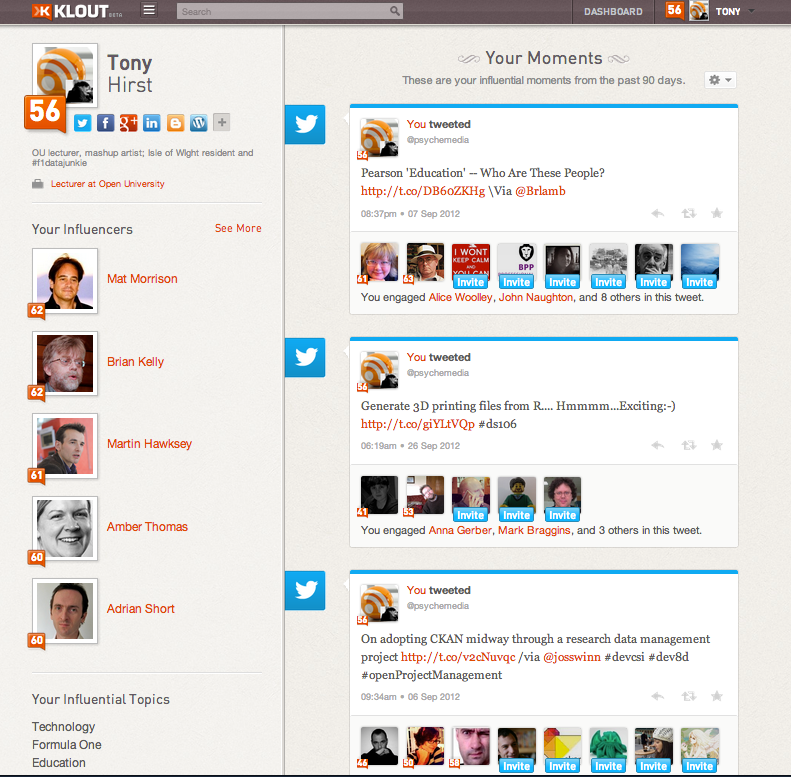 I imagine Klout obsessives may also increase their score simply by being so. It would be interesting to map out a little part of a hybrid social network (eg around @mhawksey) to see if he was influencing folk who were separately gaining reputation either mainly from Twitter, or mainly from Google+, or conversely, split across them. I’m trying to visualise this in my mind’s eye… maybe a set of folk showing typed connections between them (friend on Google+, friend on Twitter) and then some sort of indication of their Klout score (eg node size). I don’t think Gephi supports multiple/parallel edges with different labels between the two nodes (it didnlt last time I tried)? Graphviz does I think; not sure about igraph?